Campaign Cartographer 2, an excellent commercial Windows app for producing printed maps, available from ProFantasy Software Ltd. (blank sector and subsector maps are included). Galactic, a freely-available DOS program (and IMO the best Traveller sector mapper on PC), available from Jim Vassilakos' site. 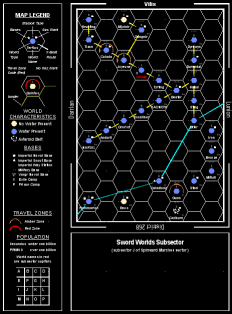 If you want to know more, you can take a look at the readme file, or download the sample FCW files (64K zipped): a sector map of the Spinward Marches and a subsector map of the Sword Worlds. Version 1.1 corrected an error which meant that the interpretation of gas giants and planetoid belts was reversed. The sample files have not been updated. Version 1.2 uses "INSSYM" in the scripts instead of "SYMBOL", which has stopped working in CC2 Update 6. Alpha versions of a new revision are available. If you would like to help out, contact me. A Campaign Cartographer 2 file with the standard map grid in place (on the Border and Hex layers). It copies the look of IS Form 21 as printed in the World Builder's Handbook; I intended to do a TNE-style version as well, but never got around to it. Word documents featuring blank ship cards from Imperial Squadrons, the forms from Pocket Empires (genetics cards, family trees, member world cards and turn record cards), and a worksheet for use when developing star systems using Leroy Guatney's revised Scouts work.